The claustrophobic nature of the setting – an ordinary family home – adds to the creepiness of the situation. It also helps that the acting is superb. Expect to be scared silly by this creepy horror flick, which has been making audiences afraid to sleep alone for more than forty years. 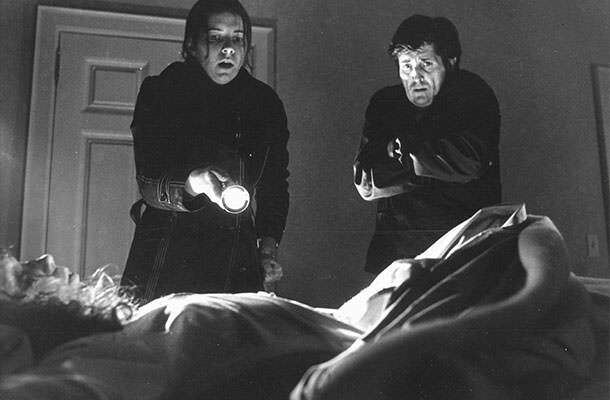 “The Exorcist” is based on the terrifying novel by William Peter Blatty that has spawned a total of five movies. However, none can compare to the original which was nominated for 10 Academy Awards. Even without the help of special effects, the film is thoroughly convincing and contains some truly heart-stopping moments that terrify even the toughest horror fans. The infamous spider walk scene where Regan descends the stairs in a contorted position was cut from the original movie. This was because the strings holding the actress up were clearly visible onscreen. The strings were removed using computer software later on, and the scene was included in the film’s rerelease.